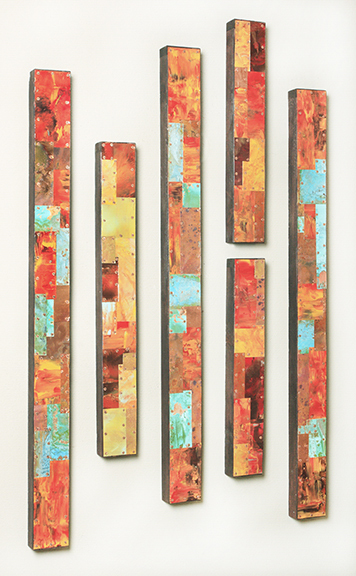 Copper wall art by Paul Rung. Photograph courtesy of Paul Rung. During 20 years as a commercial/advertising photographer in Chicago at his own studio, Paul Rung was always working on fine art photography and looking for new ways to present it. Noticing that everybody seemed to show photography at galleries in the same way—with a white matte and a simple black frame—he set out to create something different. He started photographing a lot of reflective objects and liquids on metal backgrounds that he would make himself. When Rung started out, he didn’t have the vast resources of the internet and he had to develop processes on his own through trial and error. He still uses these tried and true skills and doesn’t pursue new methods through You Tube or other websites. 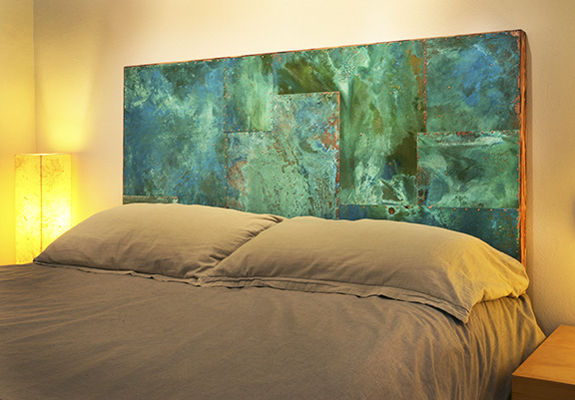 He now makes custom mirrors, sconces, clocks, small tables, and murals of all sizes. Subject matter relates back to nature and the landscape around us.